When a user makes a mistake, or attempts an unauthorized action, what happens? Do they receive a confusing error message, or an error message with clear advice on how to resolve the issue? In my experience, it’s typically the former. Most error messages mean nothing to the user, and provide no guidance as to the user’s next steps. The result: frustration. One of the most common ways developers annoy their users: They accidentally turn their applications into scavenger hunts. They place navigation elements, or essential buttons, on different places across screens…which frustrates users to no end. Your application must provide the user with a clear path. Take the screenshot below, for example. 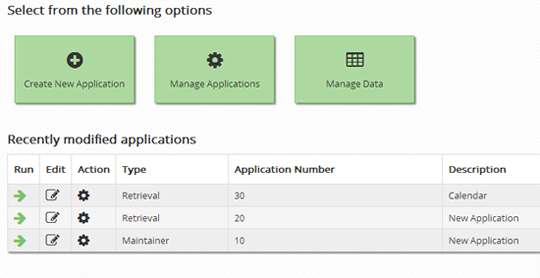 When a user logs in, the application delivers three clear options. Sure, the application is capable of many more tasks, but adding all of those options will only complicate the process for the user. Don’t focus on the application’s capabilities. Focus on the user’s goals. One of the big complaints surrounding the healthcare.gov fiasco was the registration process. Users were forced to complete a lengthy registration process (that frequently failed) before they could see available healthcare plans. This is a usability no-no. If you must ask for user information before granting access, keep that info to a minimum. Lengthy registration processes will only drive away potential customers. Another point on this topic: Make sure you tell the user just how much time the registration process will require. Nobody wants to get started on a registration process, only to realize later that the registration form is 10 pages long and requires a half hour of their time. This is an issue on two levels. First, clickable areas must be as big as they appear. What does that mean? The image below highlights this issue. You’ll notice that what appears to be a clickable button is actually a small text link inside a box. Clicking the button itself will do nothing…unless the user clicks the text. Imagine how frustrated your users will become when they repeatedly click an apparent button that doesn’t actually do anything. I’m seeing a problem crop up more and more: When cloud-based software companies redesign their interface, they blame negative user feedback on a “fear of change.” While that does happen, it’s a dangerous approach to user feedback. Sometimes, interface redesigns remove features that users loved, or complicate common actions. While many users do dislike change, don’t automatically group all complaints in that bucket. What do you think? Would you add anything to this list? If so, feel free to share in the comments. Registration process is required for a site. But if the process is too long, means some unnecessary fields are putted in the registration process. It’s something like a irritating the user to fill the form. So the registration processes is minimal as possible as and try to put the necessary field in the registration form. Thanks for sharing this information. Really it is true. I have never thought about it. Thanks for your points. can you please give me more info about Lengthy Registration process.. I need it. In that point, I’m referring to the common practice of asking for too much user information right off the bat. For instance, many companies require that users register in order to access certain content, or use a trial version of their software. If these companies ask new users for too much information initially, they’re likely to drive away potential customers. Keep the registration process limited to only essential user information, and you’re likely to attract far more users. website can be successful, you must first carefully research your target audience in the specific market you’re trying to reach. Use your research as a foundation for the Web design process.targeting everyone isn’t an option. Attempting to please the masses might leave you pleasing no one. It’s best to figure out your most frequent users and focus on creating the best possible experience for them. Yes you point is right such mistakes are killing usability. Web applications need to be simple and easy and user experience need to be there.